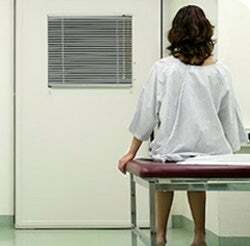 Phoebe Terry, taking her potential safety into her hands, writes an article for Babble today entitled, "Why I had a second-term abortion." If you've been reading some of George Tiller's patients' stories, the reason isn't a surprise. Terry was 40 when she became unexpectedly pregnant; she had one miscarriage behind her, an 18-month old son and a lot of love for the child she was expecting. At 12 weeks, given her risk factors, they had an early ultrasound to check the child's nuchal fold measurement, a measurement of the translucency of the space at the back of a fetuses neck. In cases of normal fetal development, it appears as a black bar; in abnormally developing fetuses, it indicates a damaging fluid build-up. In Terry's case, the problem was obvious even to her at a glance. What should have been a tiny line of darkness looked like a deflated balloon stretching from the baby's neck down its back to its rump. I simultaneously noticed that it looked wrong and immediately deleted the thought from my mind, asking instead about the profile, the legs, the hands. The technician leaves, and a doctor comes in to inform Terry and her husband of their suspicions. He told us that instead of the two millimeters they expect to see, our baby's nuchal translucency measured 76 millimeters, off their charts. He suspected Trisomy 18, a chromosomal disorder that kills most affected children before birth, and the remainder a few days or weeks after. The rare child who survives more than a few months with Trisomy 18 will be profoundly mentally retarded and painfully physically disabled. Virtually none survive more than a year or two. Once it was confirmed with a genetic test, Terry and her husband had no doubt of what they would do. We agreed we would almost certainly terminate the pregnancy, we would say goodbye to this very much wanted, very much loved child. Although it seems like an obvious decision to Terry and her husband, some in the anti-abortion movement decry even these abortions, despite the fact that a continued pregnancy is likely to result in miscarriage or stillbirth, both of which carry risks to the mother. Terry ends up at the A Heartbreaking Choice website, reading the Kansas Stories that drew so much attention last week. She realizes that, in some small way, she was lucky. Reading their stories, I realized I was almost lucky; I live in a state where insurers cover the nuchal fold test, I was old enough that it was recommended. If my situation had been different, I might have found out about this baby's condition when they did, at the 20-week ultrasound - after feeling the baby move, after weeks in maternity clothes, in the midst of shopping for cribs and bibs. Terry goes through with the termination, under sedation. And while some of her friends euphemistically refer to her miscarriage, Terry calls it by its name: her choice. But when your pregnancy takes the kind of turn mine did, all your mothering boils down to one choice - and I chose to spare my child the suffering of a brief, painful life. Of all the million and one things I wished I could be doing for this child, the only act of love circumstances allowed me to perform was this one. The only thing Terry doesn't acknowledge is that she made a second choice: to talk, without shame, about the love it took to make the first one.